For Term 4 we will be commencing after school art classes in POKENO with our talented tutor Sarah Quinlan and will be continue with our existing after school classes in PONSONBY and PUKEKOHE. Please note all art classes commence in week 2 of term 4. Classes week commencing Monday 19th October 2015 (week 2 of Term 4) and run until the end of term. Pukekohe term fees for term 4 are $120.00 for Monday sessions (due to labour day) and $135.00 for Tuesday and Wednesday sessions. Pukekohe after school classes are based at ‘Sir Richard Taylor Weta Workshop’ within Franklin: The Centre, Massey Avenue, Pukekohe (same building as the Pukekohe Library) or our Home studio, 29 Roulston Street, Pukekohe. Ponsonby term fees for Term 4 are $170.00 full term is payable in advance to secure a place. Ponsonby after school classes are based in Ponsonby Community Centre, Ponsonby Terrace. Pokeno term fees for Term 4 are $120.00 full term is payable in advance to secure a place. In this clay class students will learn a variety of different clay techniques producing at least two items including an Ugly Mug and Shelf Bird. We then bisque fire their work ready for painting with under glaze. All work is glaze fired ready for collection. In this clay class students will learn a variety of different clay techniques to produce a Christmas Santa, elf or snowman. We then bisque fire their work ready for painting with under glaze in the 2nd session. All work is glaze fired ready for collection prior to Christmas. For more information or to secure a place for your child please contact us. Please note all our sessions have limited places available. We are taking expressions of interest for our PRESCHOOL sessions ‘ The Artful Splodgers’ for term 4 in Pukekohe, for more information or to express your nterest please contact us. We are also taking expressions of interest for holiday workshops and after school classes in other areas. This entry was posted in Admin, Newsletters on 08/11/2015 by Phil. We hope you enjoyed the holidays as much as we have here at Young at Art. We are extremely proud of the work our students have produced Auckland wide these holidays. We are excited to be commencing our Ponsonby after school classes this term in Ponsonby Community centre on Tuesday afternoons. Classes will commence in Pukekohe and Ponsonby for Term 3 week commencing Monday 27th July (2nd week of term as usual). As usual our existing student’s places roll on to the next term unless I am informed otherwise. For more information or if you would like to reserve a place for your child please email: anna@youngatart.co.nz, bookings are essential as places are limited. We are fortunate to have guest tutor Susan Louie for term 3 offering a specialist glass casting workshop in our home studio. We will also be offering an acrylic painting workshop and getting our new printing press into action with a dry point etching workshop. Looking for a creative space for your art projects? Then come along to our home studio space on a Friday open studio session for adults 9.30-2.30pm. Tea and coffee provided, large easels and supervised use of our printing press available. Please supply your own art materials. PRESCHOOL SESSIONS – ‘ARTFUL SPLODGERS’ are now available for Term 3! We love to create projects from other people’s unwanted treasures. Please let us know if you have anything exciting in your garage or shed which you would like to dispose of our way. In particular this term we are on the look out for ice cream container lids (our paint palettes) and jam jars please. Don’t forget we also offer ‘Arty Party’s’, face painting, fairy, glam or gore parties, balloon twisting & other entertainment through Magical Masquerade Professional Face Painting. www.magicalmasquerade.co.nz. Bookings are essential for all of the above classes as we limit sessions to small numbers. This entry was posted in Admin on 28/07/2015 by Phil. WOW!!! What an awesome spring holidays we have all had. 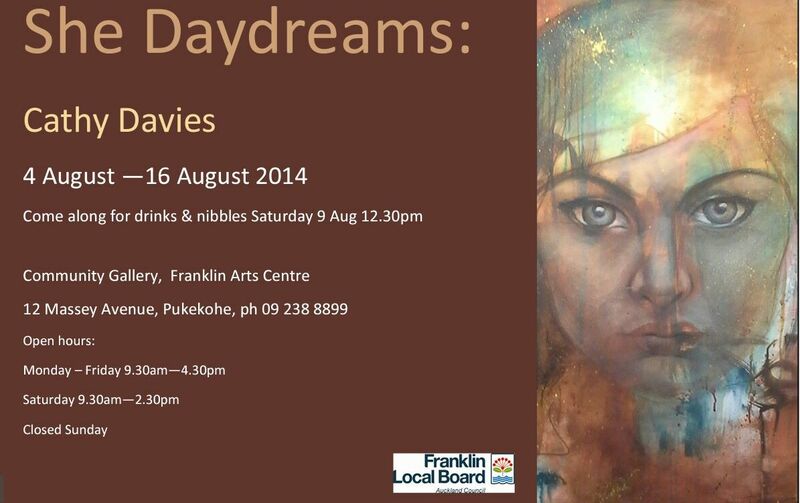 Full of creative workshops and also our exhibition opening in Franklin Art Centre. Our tutors and I are extremely proud of all of our student’s wonderful work and we’re thrilled to receive so much beautiful work back for the exhibition this year. The students exhibition runs from Thurs 9th October to Thursday 23rd October. Please feel free to go along and check it out and invite others to attend too! This term we will be kicking off with a Halloween project with our crafty tutor Cherie (as I am away for our first week of classes). When I return we will be straight into hand print portraits, two point perspectives, followed with a Christmas dimensional piece of art. We will also be working on our Christmas collaboration for the Santa Parade. Classes will commence in Pukekohe for term 4 on Monday 20th October – the 2nd week of term as usual. If you would like to reserve a place for your child please email as soon as possible as we do have a waiting list for some classes. Please contact Anna on 09 238 1939 / mob. 0297 712 923 to register for this class, places are limited. If you are interested in after school classes in any other areas please contact us to see what arrangements can be made. NEW Additional older student class for 2014 – Due to popular demand we are looking to start a later art class for older children on a Tuesday for 2014 (6.30-7.30pm). Please contact us with your expression of interest if this is of interest to you for term 4. We will be holding the following clay class during term 4. Please contact us as soon as possible to book as places are limited. The time out sessions have now moved to Wednesday evenings 7-9pm and commence on Wednesday 23rd October. Feel free to bring along your own project to work on in creative company. Contact us for more information. Pukekohe Santa Parade this year will be held on Sunday 7th December at 2pm. We will be working on a collaborative project during term 4 but would also love all our other students to come along and join us in the parade. Don’t forget we also offer ‘Arty Party’s’, face painting, fairy, glam or gore parties, balloon twisting & other entertainment through Magical Masquerade Professional Face Painting (our sister company). www.magicalmasquerade.co.nz. We love to recycle at Young At Art! We are currently on the lookout for metal coat hangers for our sculpture project but always love to receive anything exciting to set us off on a creative challenge. For more information please contact Anna onanna@youngatart.co.nz or phone: 0297 712 923. This entry was posted in Admin on 19/11/2014 by Phil. We hope that you all enjoyed term 2 and the busy holiday workshops with us. We are delighted to have had so many new faces joining our familiar ones too. We will be diving into term 3 with silk screen printing, surreal skylines, our artist study will be Miro (Sculptures) and we will be continuing our drawing studies. Classes will commence in Pukekohe for the term 3 on Monday 28th July the 2nd week of term as usual. If you would like to reserve a place for your child please email as soon as possible. If your child was registered last term they will be automatically re-registered for this term. Please let us know ASAP if they do not require their place this term. We only have a couple of places available for these classes at present. Please contact Anna on 09 238 1939 / mob. 0297 712 923 to register for this class, places are limited. If you are interested in a clay course or in arranging classes for home school students please contact us to discuss options further. We have the dates set for our Young at Art 2014 exhibition from 10th October through to 22nd October. Opening night for our student family and friends will be on Thursday 9th October. This exhibition is open to all Young at Art students (old and new) who have produced work with us in the last year in after school, home school or holiday’s workshops. We will email more exhibition information in September. Please could you keep your children’s artwork stored safely in the meantime. The very talented Cathy Davies, who is an amazing local artist, will be holding an exhibition of her own work. We would love to see you at this opening! We wish you a creative and warm winter term. This entry was posted in Admin on 21/07/2014 by Phil. Counting down to the Young @ Art exhibition at the Community Gallery, Franklin Arts Centre, Pukekohe – opening 26th September to Friday 11th October. This is open to all students current and past all mediums (including clay, sculpture etc), term time. holiday and home school. 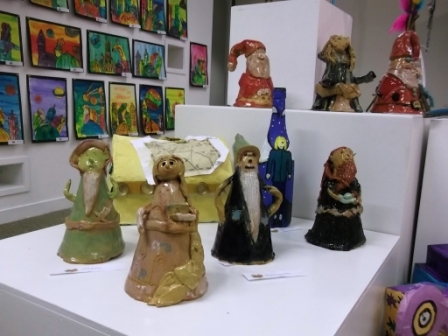 If your child would like to exhibit their work please bring along to the Weta workshop Mon-Wed between 3-5pm or Thurs 3.45-5pm. We would love to show as much art work as possible. Opening night for all will be Thursday 26th September 5pm – 6.30pm. Looking forward to seeing all your guys work again. This entry was posted in Admin on 11/09/2013 by Phil. Date: Monday 30th Sept, 9am – 1pm (suitable for 7 – 14 yrs) Cost (1 day): $35.00 Design, create and carve these terrific tiles and then paint with oxides. Tiles will be fired and ready for collection two weeks after this one day workshop. Learn the basics of beautiful handwriting and then create a project turning your words into a work of art. Design, sculpt with clay and papier mache your marvellous mask. We will then paint and decorate our mask ready to wear or hang. Design and create your very own mixed media Rocking Robots and Dancing dolls, spectacular wall art. Learn a variety of printing techniques using every day objects. On day 1 we will create paper masterpieces and day 2 print and design on fabric. *Fabric squares will be provided , your child is free to bring a long a t-shirt or pillowcase if you prefer, 100% cotton is best. Learn how to create your own interesting collage papers, design your cupcake and then collage away to create an amazing piece of artwork worthy of any wall. In this fabulous painting workshop discover a variety of watercolour techniques and then complete a beautiful finished piece of work ready to hang on your wall. Have fun with decorative fabric to create a fantail fish & a seascape weaving. You can embellish with quirky seaside finds. Breathe new life into everyday trash, create your very own interactive masterpiece using mostly recycled materials. On day 2 we will be creating a Fortress & Fairy Wonderland Felt tip holder. For bookings or more information please contact Anna on:Ph. 09 238 1939 / Mob: 0297 712 923. This entry was posted in Admin, Holiday Workshops on 11/09/2013 by Phil. Hey YAA has finally arrived with it’s very own web page into the 21st Century to accompany our Facebook and Twitter pages. We’ll keep you abreast of all the latest news, exhibitions, school classes, holiday workshops and anything else that we’re lucky enough to get to have a go at in our world of arts and crafts. If you have any ideas or suggestions please feel free to let us know so that we may accommodate it wherever possible. This entry was posted in Admin, Art Classes, Holiday Workshops on 02/09/2013 by Phil.